Discover the full-flavoured taste of the Nation's favourite coffee (1). Experience a rich coffee flavour with every mug. Savour a fantastic coffee aroma when you open the jar. Enjoy the taste of NESCAFÉ Original every morning. (1) Source: Global data, Volume sales, 52w/e Feb 2018. 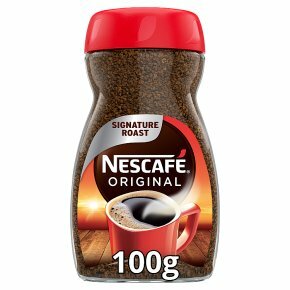 Start your day with a full flavoured coffee The full flavour of NESCAFÉ Original makes it the Nation's favourite coffee (1). Grab a mug and start your day with the great taste of our distinctive blend. Our medium-dark roasted coffee beans and advanced double-filter technology, give every mug of NESCAFÉ Original a rich, full flavour. 1) Add 1 heaped tsp (1.8g) into your favourite mug. 2) Pour in 200ml of hot water. 3) Enjoy your full-flavoured coffee!